At each liquor-licensed location, licensees are required to post, or have on file, specific documents. 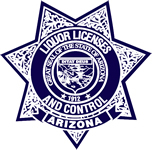 When an officer conducts a Routine Liquor Inspection (RLI), the documents listed below will need to be accessed and made available during the inspection (R19-1-502(C)). Exception: The Employee Log may be kept on file at an off-site Human Resources office. If this is the case, the officer will allow the licensee to access the Employee Log for inspection at a later, agreed upon time.